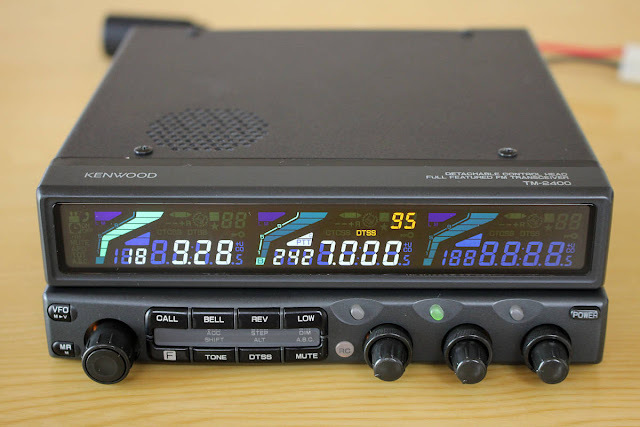 Kenwood TM-2400 2.4ghz transceiver. This is the worlds only commercial 2.4ghz amateur band FM tranceiver. It is based on the TM-742 chassis, looks identical and can accept other TM-742 band modules in addition to the 2400mhz module already installed. Year: 1990 Category: Amateur Transmitter/Receiver (and Transceiver) Semiconductors (the count is only for transistors) Semiconductors present. Wave Bands given in the notes Superhet double/triple conversion Wave bands. Power type and voltage Storage Battery for all (e.g. for car radios and amateur radios) 13,8 Volt Loudspeaker Permanent Magnet Dynamic (PDyn) Loudspeaker (moving coil) Shape Miscellaneous shapes - described under notes. Other: Dispite its triple appearance, this one is only capable of one optional band. It's due to the large size of the 2400 MHz part. See rear picture below.